So, to all of you out there a happy, peaceful Christmas and a happy start to the new year 2012. But I also wish you of course that the rest of 2012 will bring you what you really wish for, what you may have worked for. I wish you joy and happiness and contentedness. Contentedness was something my grandma always emphasized on when she was still lucid – very important: Contentedness. For Christmas we flew to visit our families and friends in Germany. It was as always a whirlwind tour of trying to defy the time-space continuum. The challenge is usually when we visit the motherland to accommodate family and friends and then squeezing some time out for ourselves. We had one entire day to ourselves, took the train and went to Paris – just for the day. The above picture we took as we stopped for a breather and pick-me-up in the shopping center Galleries LaFayette. This is not a modern shopping temple, not it is a grand old dame of shopping. 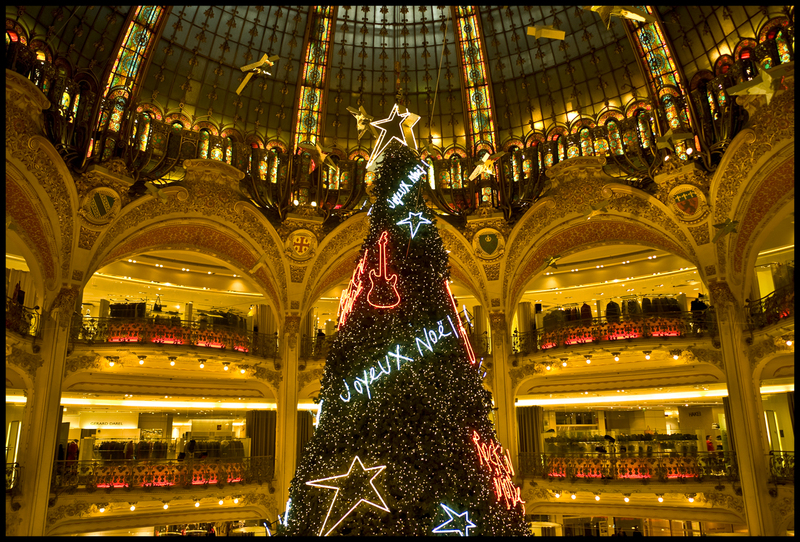 LaFayette is in competition with the other grand old dame of shopping in Paris, Printemps throughout the year. But come Christmas, the pull all the stop signs and hire Paris’ finest fashion designers to decorate the windows on first floor (parterre as the French say). One designer of Asian descent and the man himself Karl Lagerfeld were trying to out-do each other this year. The topic was apparently marionettes (puppets). Un fortunately, I do not have any picture, because the people lines up ten deep in font of the windows. But based on the glimpses and the “Uuuhs” and “Aaah” it must have been quite spectacular. Alright, I will go back to bed and try to get she sleep. I will post at least one more entry this year, so we will meet soon again. Until then stay sharp. Last week I did Phuket Ironman. And to my great pleasure and surprise I had a lot of fun. I felt good – it was just great. The weather played along nicely. The heat was down to maybe 26C and no oppressive humidity. In fact the day before and during the bike leg on race day it rained heavily. The thing that I dreaded the most – the run leg -, due to my constant bad experience during the last 5 months in training, turned out almost easy. I wanted to post about my progress as I was training, but never did, because I felt there was no progress. Especially running in the Bangkok heat and humidity almost killed me. My body never did adapt properly to deal with these conditions – at least not yet. But then 3 weeks ago, I had a little break-through. I ran in Germany in 8C and got my confidence boosted, because I was able to crank out decent times and put together a decent run. And then last week in Phuket the weather played along and stayed somewhat cool. I am very happy about this turn of events and that the prep and the race is over now. I have my life back. Of course, I am looking for the next thing. It may not have to be a Half Ironman distance event, because the conditions here are simply sub-optimal, but there are other things that also allow a person to peel the onion. Peeling the onion is a term I use to describe why I do these strenuous vents. See when you peel the onion, you eventually get to the core of the onion and you can see what it’s made out of. In my case I see what I am made out of and if it matches with what I think I am made out of. On race day you have about 5 to 6 hours to yourself and your thoughts. No cell phone, no email, no conversation, no meeting, just you – body and mind. When you peel the onion, these two – body and mind – get re-acquainted, because they need to cooperate and collaborate in order to finish. I was physically exhausted after I crossed the finish line, but also mentally refreshed and rejuvenated. Try it – peel your own onion. Do you like what you see?